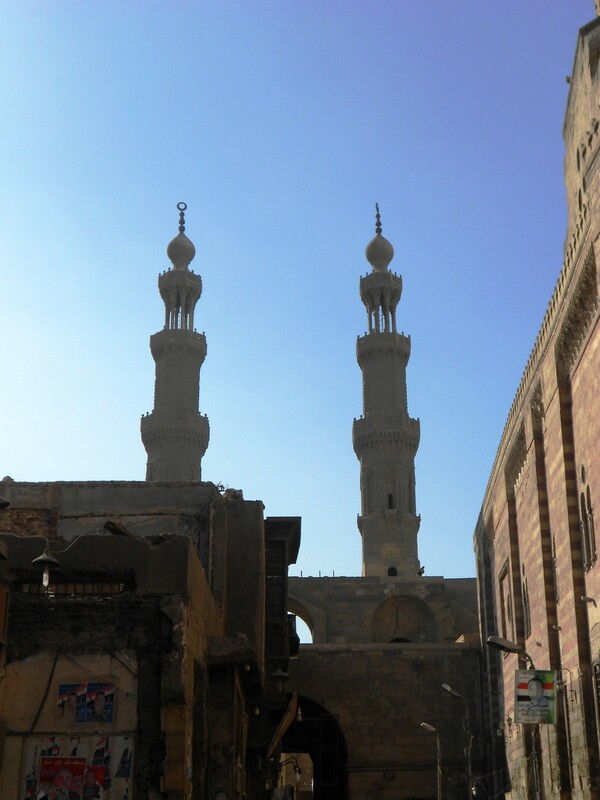 In the city of Cairo twin minarets stand tall, their silhouettes marked against a clear blue sky. They stand distinguishable from a thousand other minarets because of their fame as a city landmark. The minarets frame a gate still standing since the 11th century, the gate of Bab Zuweila. The minaret towers are so high that they were used to look out for enemy troops coming up to attack the city. Now, centuries later, the minarets of Bab Zuweila provide an unparalleled view of the old city of Cairo. You arrive at the second level. And it’s even more magnificent than the first. To your right you see Al Azhar Park, significant for its large and beautiful green space in a city that has so little. In this 360 degree view you see vast numbers of minarets, you hear the call to prayer going off at split-second intervals across the city – a cacophony echoing around you. You see thousands of tiny people, walking about as they go from bazaar to mosque to bus. You see the tent makers bazaar and even from this distance, you can see the beautiful colors. It’s the view from above. And it is glorious, breath-taking and conversation stopping. But you can go even farther. And once you get to the top, you don’t want to leave – because it took a while for you to get there and you’re so tired. And the stairs going down are still rickety and treacherous, they are still centuries old. But mostly you don’t want to go down because you want to continue to look out over the view, the view above the city, above the chaos. The view from above. Lent is a time to step back and step up; a time to see the view from above. That glorious, breath-taking, conversation stopping view. That view that sees the broken world that Jesus died for, the world that Jesus loves, knowing that each day that we fight this fight is worth it. That view that remembers the words a Son called out to a Father “Why have you forsaken me?” A view that sees the grand Salvation narrative, taller and grander than a million minarets, a love that calls to us louder than a billion calls to prayer. The view where all ‘this’ will make sense, wrong will be made right, tears will turn to laughter, and sorrow to joy. We are invited into this view from above, a view where our story falls into the shadows for a time, and God’s great, redemptive narrative is remembered around the world. A story of mercy and grace, where good triumphs over evil and wrong is made right. Whether we live in the shadows of a Hindu temple or near the courtyard of a grand cathedral; in a small village or are one of millions in a large, modern city, we know what it is to see poverty and suffering, crime and inequality, evil and difficult circumstances. We learn to love when it’s hard and others learn to love us when we’re hard. We know failure, we know pain, we know how human and flawed we are. Yet daily we experience the persistence of God’s redemptive process. And today no matter where we are in the world, we are invited to remember this view from above. Note: This piece has been adapted from a piece written for A Life Overseas. 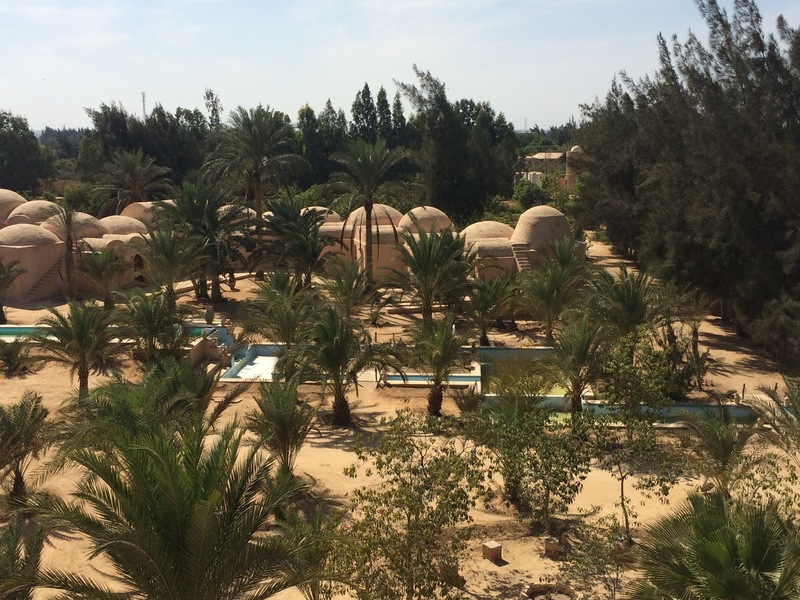 I arrived back from Egypt yesterday, bleary-eyed after hours of travel. Having coffee in Cairo, sahlep in Istanbul, and mint tea in our Cambridge living room reminded me yet again of how connected our world is. We fell asleep and woke up on the other side of the world. The trip was a gift that will take a while to process, and I plan to do some of that online, but for now I feel like I’ve been invited into a bigger picture. The timing couldn’t be more perfect. I have been deeply angered, troubled, and discouraged by the infantile politics that have become an acceptable part of our society. I am increasingly frustrated by how deeply I am connected to social media in all its forms. The trip was a break from all of that and revived me in the best way possible. Just two days ago I stood in the shadow of a 4th Century church while listening to the Muslim call to prayer. All around me, women in hijab were entering the church to read the history, view ancient icons, and hear stories about this church that has survived centuries of life. The church is known as either the “hanging church” or the “The Church of the Virgin Mary.” Built into the walls of a Roman fortress, this church is considered the oldest in Egypt. Just down a stone path from the ancient church is the Ben Ezra Jewish synagogue, built in the 9th century over a 4th century church frame. The voices of thousands who had been there before echoed from the silent walls. While leaving the synagogue, we passed a fully veiled woman, only her eyes showing. I had seen her earlier in one of the churches, now she was making her way down the same path we had come to visit the synagogue. 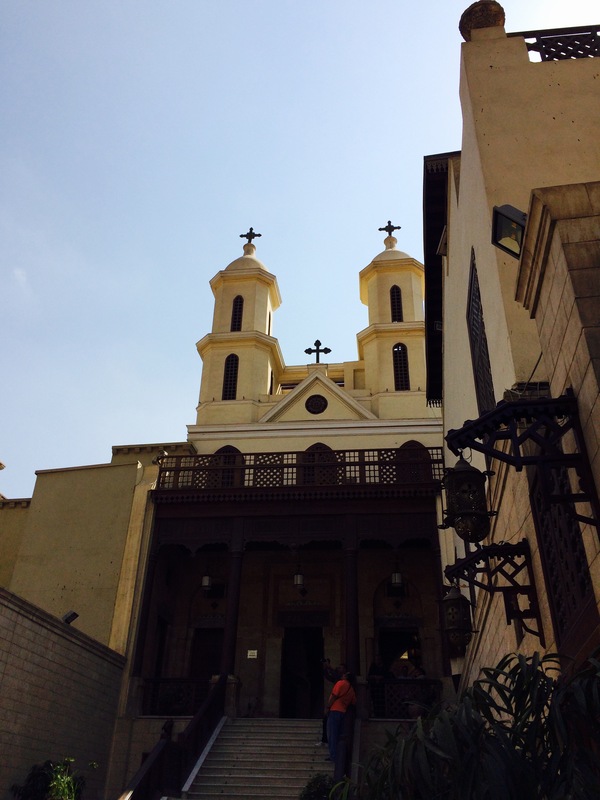 We were in Coptic Cairo, an area known as one of the oldest in Cairo. 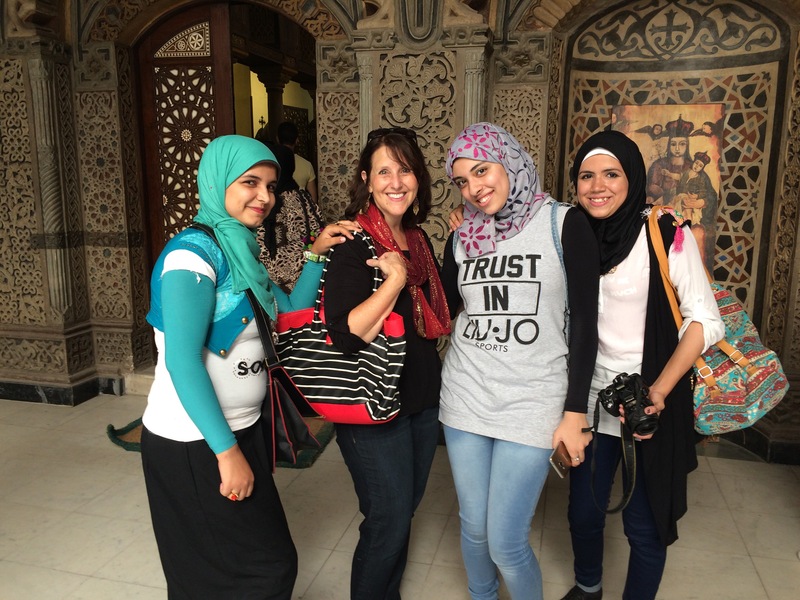 I have been to Coptic Cairo many times before but I have never experienced the sense of life and God’s orchestration of life like I did. Throughout the Bible, Egypt is seen as a place of preservation, protection, and testing of God’s people. Judaism, Christianity, and Islam have all played a part in Egypt’s history, each with truth claims that sometimes seem similar and other times are completely opposite and non-negotiable. As the call to prayer rang out from mosques across the city, one beginning as another was ending, I was struck by God’s big view of people and history. I see this pinpoint in time; he sees from beginning to end. I focus on the small things while he calls me to see the big things. I am stuck in time; he is the creator of time. I often see a narrow way to grace; he who is grace personified opens his arms wide as he calls us to himself. In those moments, I realized yet again the call to a see a bigger picture – a picture beyond politics, beyond the current crisis of the day, and beyond my own inadequacy. I’m called to see the world through eyes of love and grace only possible through knowing the Creator. It’s a mystery that will take a lifetime to understand. Three young women asked for photos with me, both individually and as a group. I was completely honored and glad the moment outside this church was captured! No Child Should Have to be the Firstborn…. Firstborn children have the joy and burden of being first. The joy of newness and expectation, the burden of insecure parenting and wanting to get it right. No child should have to be the firstborn. But someone has to, and they deserve special applause as they teach their parents more of what it is to parent, to grow, and to love with an indescribable love. In our family that someone is Annie. Today, that infamous day when buildings fell and people wept so many years ago, is her birthday. So today I pause and write to our firstborn. You turn 30 today! I can’t believe it until I look in the mirror and see the laughter lines and tear marks disguised as wrinkles on my face. And then I know – yes indeed! I have a 30-year-old. No child should have to be the firstborn — and yet, you were. After a long labor, you ushered us into parenthood with hardly a cry. “Is she okay?” we asked anxiously. But you were fine – all six pounds four ounces of your tiny self with your bright blue eyes. You were perfect. We took you home in baby pajamas that were three sizes too big for you. They were yellow with “Le Petite Bebe” embroidered on the front. During those first few hours at home you slept and slept – and we looked over your Moses basket with worry: “Should we wake her up? I don’t know. Do you think she’s okay? I don’t know.” We decided to wake you up. Two weeks later, we moved and this began the trajectory of your life. From a Chicago apartment to a house in New Hampshire to rose gardens in Pakistan; from bustling Cairo to small-town Essex – you have lived in apartments and houses and more apartments and learned to call each one of them home, even when they hurt you. We look back at pictures and you are so little and we are so young. You grew up knowing airplanes and airports, thinking that Saturday morning cartoons came in two-hour videos, eating kebabs and curry before you had teeth, having more stamps in your passport at five than many do in a lifetime, and believing that Arabic is the language of the world. You were so gentle as you taught us about parenting. You were our naiveté and our idealism; you were our youth and our mistakes; you were our uncertainty about curfews and our ignorance about boundaries; you were our energy and our travel; you were our reentry angst and our struggle to fit in the new world we found ourselves. You have given us so much grace on this journey – and we thank you. You are a reader and dreamer, you are a shout for justice and a ready made party. You are a writer, an artist, a doula, a friend. You are daughter of our youth and our heart, and we love you. And so we raise our glasses to you the firstborn – resilient, beautiful, talented, funny, irritating, brave, engaging, and lover of all things champagne on a beer-budget.